Revenue Enablers™ - Calibrate Legal, Inc. : Calibrate Legal, Inc. The discussion around "non-lawyers" isn’t simply about semantics, but value. 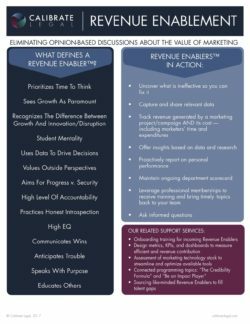 The Marketing and BD function, far from being “overhead,” is essential to the business of law firms. Calibrate Legal is committed to replacing the outdated concept of “non-lawyers” or “overhead” with Revenue Enablers™ who work in tandem with Revenue Producers to achieve sustainable growth and advance the strategies of law firm leadership. We invite you to cultivate the shift in your own firm. For more information contact Susan Van Dyke, Chief Client Officer, or Jennifer Scalzi, Founder and CEO.